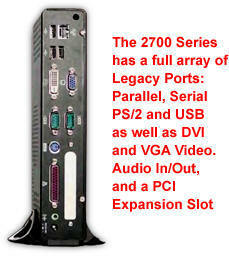 PLEASE NOTE: The YEStation Max Model 2732 no longer manufactured. The current equivalent replacement is the Computer Lab International (CLI) AG6601 Thin Client Terminal. Click here for other CLI models available for use as "Ethernet Terminals". New 122-key keyboards are available for your current Affirmative Thin Client Terminals. 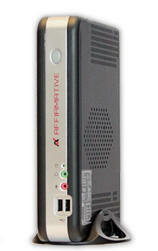 The Affirmative Technology Group YEStation® MAX III (2700 Series) is the high end member of the Affirmative family of thin clients featuring wired and wireless devices. The MAX III standard colors are black and silver aesthetically matching black LCD/LED monitors. Affirmative offers matching input devices including mice and optional 122-key keyboards with layouts that enhance user productivity when switching between 5250/3270 legacy applications and Windows/Browser apps. Dual color-coded key caps keep users on track. A heavy duty tactile feedback "Clicky" keyboard provides your users with the same 24-Command Key keyboard layout, same touch and feel as the keyboards on the Twinax and Coax termimals you are replacing with new, Ethernet IP connected terminal devices. Click here or on the keyboard image for more detailed information on this keyboard and other models available for PCs, terminals and other brands of thin client terminals. Keyboard with 24 Command Keys. No matter what type of connection you need, PS/2, parallel, serial, or USB, The YEStation Max III can handle your requirement. With all the legacy connections available, you will be able to continue using almost all of your current printers, scanners and other data collection devices connected to your terminals now.